New Realm Acupuncture (NRA) was recommended to me by a co-worker. For a while I was very skeptical about acupuncture. I finally got enough courage to try NRA because I did not want to take medications for the rest of my life. My doctor and also an endocrinologist had diagnosed me with possible hyperthyroidism and had mentioned that I may have to take medications. Simultaneously my husband and I were trying to have another child which made it a little more difficult for us to conceive because of the imbalance hormones. Within 5 to 6 weeks of going to New Realm Acupuncture Center my thyroid (via blood tests) were normal and I was pregnant. Its been over a year since my initial visit to New Realm and I am a firm believer of acupuncture as I visit New Realm Acupuncture for various heath concerns. 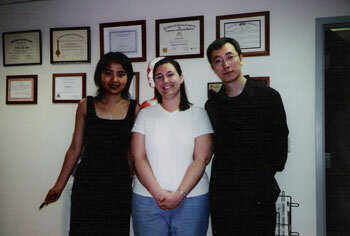 My husband and I came to Dr. Gao and Jing for fertility treatment in November 2007. We had been trying to conceive for about 2.5 years and suffered through an ectopic pregnancy. I was nervous about acupuncture because of my fear of needles. However, I felt minimal pressure during the treatments and would gladly choose these 30-min sessions over all the procedures and drugs that I had planned to start in Feb 2008. New Realm Acupuncture incorporated acupuncture treatments also for my chronic colitis. We did not have much expectation, only hoped that acupuncture would help make my body healthier to either improve our chances of conceiving naturally or increase our odds of success with future fertility treatments. Much to our surprise, we conceived one week after we began acupuncture and I was in remission for my colitis. We are very happy and cannot express enough gratitude to Dr. Gao and Jing for this small miracle of natural conception, for not having to endure the side effects, mental stress, and financial burden associated with fertility treatments. Everyone responds differently to treatments and we are lucky to have this experience. Thank you very much for your kindness, true healing spirit, and for showing us the power of acupuncture. My husband and I had been trying to conceive our first child for two years. Traditional therapy/ medication did nothing. After learning that acupuncture can help, I found New Realm Acupuncture Center. After only two months of Acupuncture, I am now pregnant with our first child. 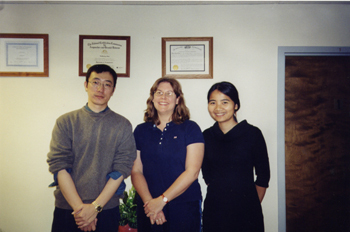 Gao and Jing’s patient and compassionate care has made all the difference. They taught me how to relax and remain calm between visits by using the acupressure seeds on my ears. At the same time, acupuncture provided relief from my environmental and pet allergies by clearing my sinuses. So much safer, healthier and gentler than toxic drugs! Gao and Jing have been blessing in our lives. My name is Utauphia Gordon (Holli) and my husband and I have been trying to have to have a baby for 10 years. We’ve had two failed pregnancies but we hadn’t been able to conceive for the last 6 years. We’d tried clomid and intrauterine insemination but because of low progesterone and other hormone problems nothing worked. Doctors told us our only option was in-vitro fertilization. We were unhappy with that diagnosis so we sought other options. We lucked up and found New Realm Acupuncture Center. I was immediately diagnosed and after only 4 or 5 treatments, we found out we were pregnant!! We couldn’t be happier. I cannot say enough good things about the effects of acupuncture and the staff at New Realm. My husband and I had been trying to have a baby for 6 years before I decided to try acupuncture. After many tests, the doctors could find nothing wrong with my husband and I. After numerous tries with different medications and procedures, with no results, it was time to move onto IVF. 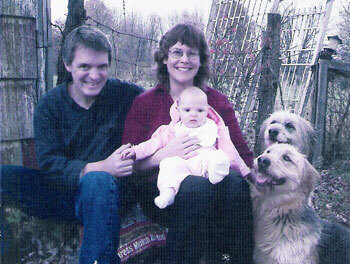 We did two IVF treatments without a positive result. We decided we would try one last time, with a new Doctor in Cincinnati. We knew this was pretty much our last chance, so I started researching the benefits of acupuncture when used with ART cycles. I started seeing New Realm Acupuncture Center two times a week about one month before my third attempt at IVF. I could tell there were positive changes going on inside my body. By the time we were ready to start another cycle, I felt so calm and at peace, hardly ever felt stressed, and felt great physically too. The next cycle was 100% different, although I was on the same medication protocol. 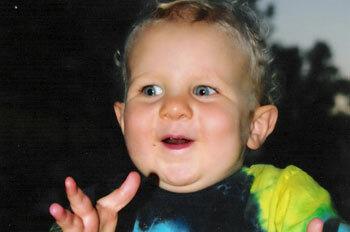 I found out a couple weeks later, the cycle had worked and I was finally pregnant with our first child Parker in 2004. I continued having acupuncture (in 2007) to try and conceive a second time, a couple weeks ago, we found out we were expecting again! I can’t say for sure that it was the acupuncture that finally made our dreams come true, but since I could physically feel the changes in my body… I have a very strong suspicion that without it, my babies wouldn’t be possible.